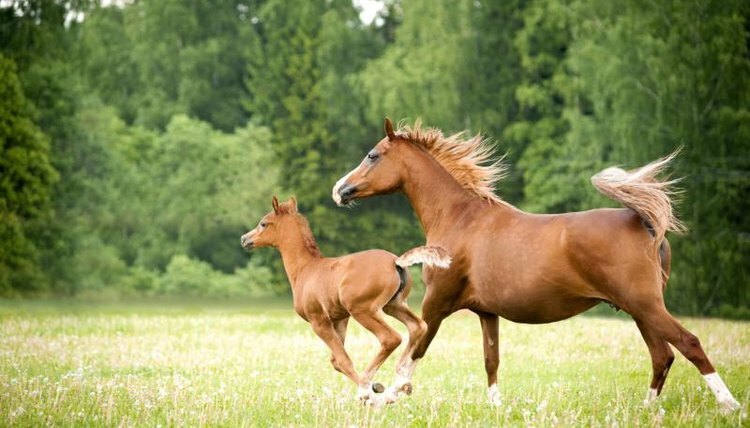 Horses are considered foals until they turn a year old. For the first few months of life, foals are dependent on their dam for food, companionship and training on the ins and outs of horse life. Playful and full of energy, most foals are able to keep up with the herd within hours of birth. Calling a baby horse a foal is a rather general term. To more specifically describe a foal, you can call it a filly if the horse is a girl or a colt if he's a boy. Both genders become weanlings when they no longer nurse, after weaning has taken place. The weanling term is replaced by yearling when the foal hits his first birthday. Foals typically try to stand immediately after birth, often walking -- albeit a bit unsteadily -- when they are only a few minutes old. They need to nurse right away, which means they must be able to stand to reach high enough to nurse. Foals start trying to run shortly after birth, sometime within a couple of hours. Their legs are already 80 to 90 percent of their adult length, which helps newborn foals keep up with the herd. Nursing might be simple for foals, but trying to learn to graze is more of a chore. Because their legs are proportionally long on their bodies, their necks haven't quite caught up. This means a foal has trouble reaching grass with his mouth until his body begins to fill in. Foals often splay their front legs wide as they try to emulate their dams' eating habits. For grain and other food you provide, using a raised feeder helps them eat with less trouble than if the feeder is on the ground. Weaning is a stressful time for foals, especially if their owners take a "cold turkey" approach and separate the foal and his dam suddenly instead of gradually. Horses complete most of their bone growth in their first year, which makes nutrition a key factor in their future development. After you wean the foal, you must take over and provide the nutrition he was getting from his dam. He should have been tasting grain and hay, but his main nutrition was still from milk. Giving him extra hay to munch on during weaning can help relieve some of his separation anxiety, keeping him occupied. Give him plenty of hay supplemented by grains or other horse feed pellets, and check with your vet about the proper amounts to make sure he's getting the nutrition he needs. The Horse: Foal Morphology: Here Come Those Legs!